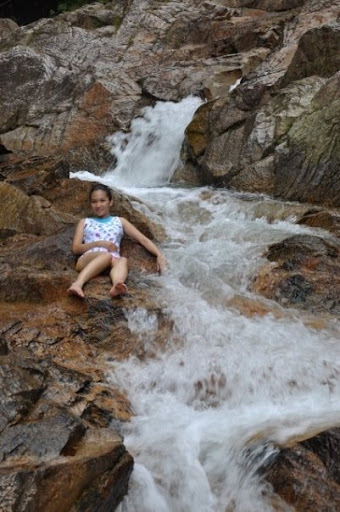 This is XeRoZ, lying on a bed of cascading waters..
Me, on the hanging bridge~!! Take one step at a time..Dont be afraid...~!!! May the best wins it all~!! 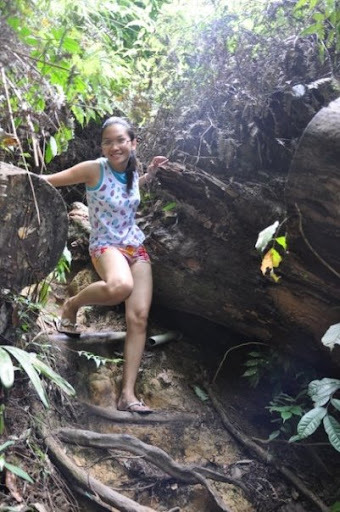 I'm not a person who enjoys nature very very much. But i do have feelings for a nice, clean, green places, with cool, fresh air and not so tiring place. 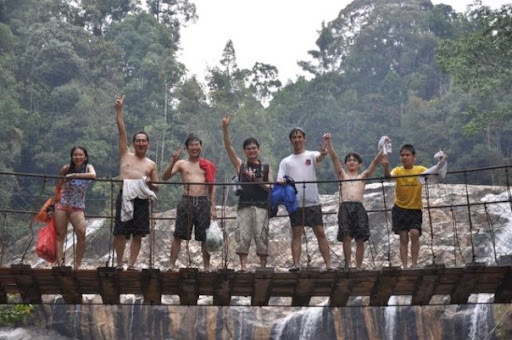 Last weekend, i had the opportunity to join XeRoZ's family to Sungai Lembing. Our first destination is Hutan Lipur Sungai Pandan.. It took us about 5mins walk to reach the waterfall.. 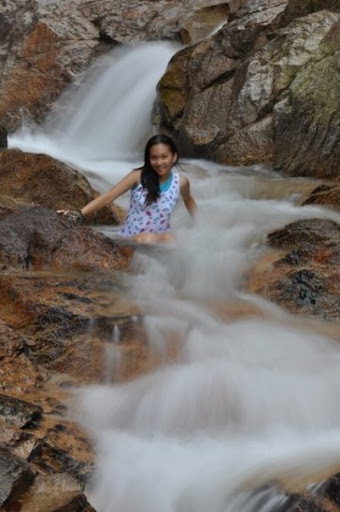 I was gaping at the huge waterfall infront of me..then i realised..i'm alone!!! They took 5mins to get up there..I took 20mins..*panting*.. 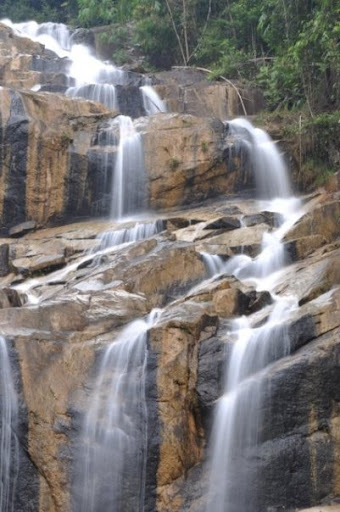 Instead of muddy banks, filled with human feces and urine..This waterfall is clean, clear and has a sandy beach.. SO, the everyone takes advantage of the nature.. 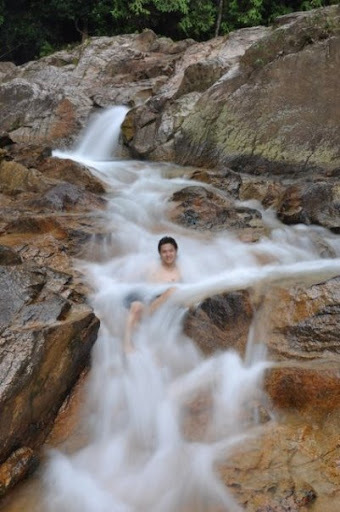 I'm afraid i will be pulled by the water force..so i just dipped my legs..
At the end, some kind souls finally volunteered to take my photograph..
You dont need a good DSLR to get good pictures.. As long as the nature's beauty is untouched, any camera will be fine.. 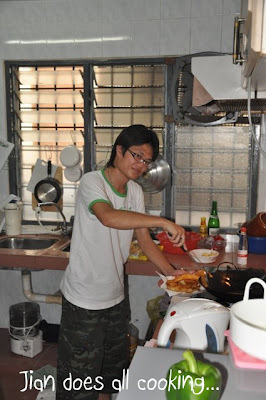 I have more photo's in XeRoZ's DSLR..HAHAHA...So..wait up for my upcoming posts.. 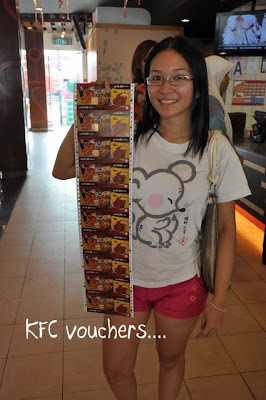 I won the KFC-Nuffnang competition on 10th July 2008..
1 snack plate : RM9.80 +10% tax = RM10.80..so i can eat approx 9 plates of snack plate!!! But i sacrificied my snack plates and make a party for my beloved buddies-voters. Also have special appearance of Shereena and TianChad, who seemed to be huge Anglia Shandy fans.. 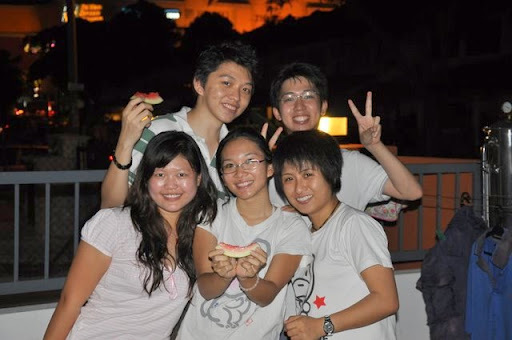 Ground level: Nicole, Aimei, YiWern, Kar Yee, Ah Liu, AhLiu's friend..
*Not in photo: Christine, Christine's Friend, Raymond, Edwin, Kitt, Ah Goh.. 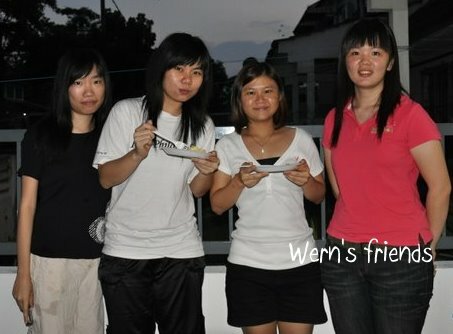 Thanks to Wern's friend who brought all the nice food for us to eat!!! 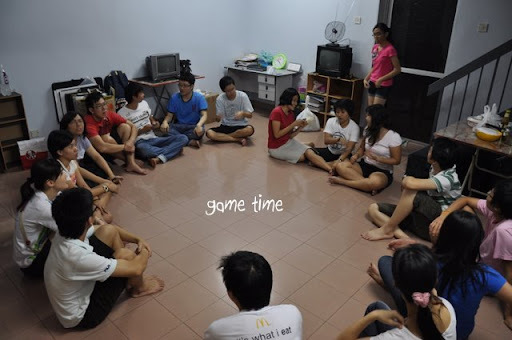 From my uni, only us 5....*sigh* Where's all my friends..??? 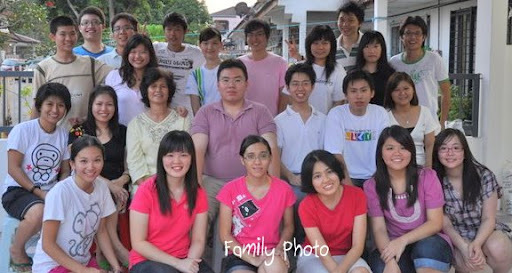 The rest of the guests are Jian's primary, secondary schoolmates..also my mamak mates.. Remember about a post i did few months back? Yups, I won myself a pair of invites to catch the movie, Ghost of GirlFriends Past from Nuffnang!!! Because me and TianChad both had the tickets, so Wern and Mingz are invited to join us~! We were amongst the first to enter, the hall is superbly empty! This story is about a celebrity photographer, Connor Mead (Matthew McConaughey), who never believed in feelings or true love. To him, love is the comfort for those who are weak. His brother, Paul, is marrying Sandra, and Connor was Paul's best man. 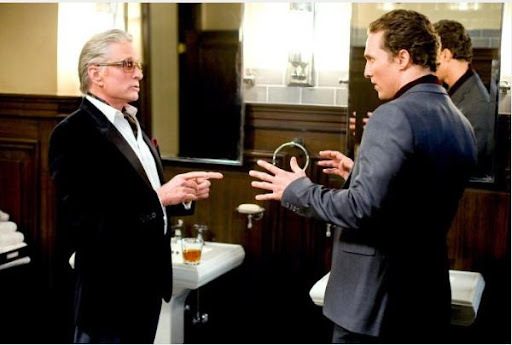 Uncle Wayne (Michael Douglas) who was dead long ago..How do we know he's a ghost? *whisper* There's noo reflection on the mirror!!! Uncle Wayne warned Connor to change his ways, otherwise, he will regret it the rest of his life, being pathetically lonely. Connor was stubborn, and Uncle Wayne told Connor, he will be visited by 3 ghosts- Past, Present, and Future! 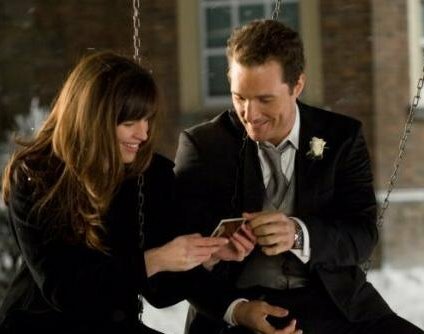 Connor's childhood love, Jenny (Jennifer Garner) who tried to change him, but failed. He fell in love with her, then realised he's being spoony or weak, and left her..
After 3 ghostly visitations...Connor was frightened, turned over a new leaf, and helped saved Paul's wedding..
Jenny and Connor...were happily together ever after..
What I think about this movie? No love chemistry between Connor & Jenny.. The Future Ghost never talks, wore white long robe, at the end, dont know who she is. Uncle Wayne told Connor to change his ways, or else will landed up like him. But he look pretty good as a ghost, and he's still a womanizer ghost. So, why bother asking Connor to change? Paul will make a good husband. Sandra is mental. She sounds just like my housemate. I feel for Paul.. The bridesmaid and best men were all despo. I think The Proposal is much better than this. Yesterday, I went to watch the movie "The Proposal", starring Sandra Bullock and Ray Reynolds at TGV, One Utama. First and foremost, I would like to thank TianChad for the movie tickets! I was rushing to One U, because Wern (My Baboon Sis), had late classes. It was 8.25pm when i went to pick her up. As i was driving, i noticed there's something wrong with my car! It won't lock when i brake. TianChad told me that we have to collect the tickets at 8.50pm. And i was relieved that i managed to reach One U at 8.45pm. Unfortunately, my car's alarm has some problem. It just kept ringing and ringing whenever i lock my door! So i decided to lock it manually (for the first time), and my heart's feeling uneasy! We managed to collect the tickets in time, and astoundingly, the cinema is very full!!! Me and Wernie had to sit 3 lanes from the screen! "The Proposal" is a very light, nice, romantic, easy going, comedic movie which I enjoyed tremendously! It is about a corporate, super-lady-who-does-not-need-any-guy-in-her-life, Ms. Margaret Tate, and her ambitious-wannabe editor-secretory-assistant Mr. Andrew Paxton. She was a very demanding, commanding + freak boss, whom is hated by everyone in the office. While, Andrew, because of his dream of becoming an editor, he worked very hard for her. Margaret's Visa has been rejected, and she will do whatever it takes to stay in America, even by forcing Andrew to marry her! So she proposed to him..The imigration officer smelt something fishy going on and threathened to investigate their relationship. So, in order to make things work, they decided to visit Andrew's family to celebrate grandma Annie's 90th Birthday! Andrew announced their engagement...And they going to get marry!!! Margaret started to realise that Andrew is a richman son who owned an empire of business in Alaska, sacrificed everything and work her just because of his ambition to be an editor. Andrew's family members were overwhelmed and very very nice to her! And, during the wedding day, Margaret calls it off, and decided to be deported to Canada. Andrew, feeling pissed off with Margaret, chased after her..and..
Sandra Bullock - She's one of my fav actress of all time. She's aged, not as pretty as before, but this role really suites her. Ramone- This silly guy has multiple roles: Waiter-->Exotic Strip Dancer-->Electrical Shop Salesperson-->Wedding Pastor. The chemistry between Andrew and Margaret is very sweet, and funny- The eagle capturing dog + Strip dancing scene + Naked Scene + Breakfast on Bed Scene + Grandma Spiritual Ritual Scene+ Wedding gown scene + Grandma heartattack scene..
All of these scenes add up...The Proposal!!! Catch up with you later, gotta work now.. I'm glad!!! I kinda get bored very fast with things i owned. That's why i keep playing with the html codes, trying to challenge my knowledge and stuff, but usually failed de. So this time i guess, i kinda like the new look of my blog. What bout you??? In a mystical land, located deep beneath our hearts, there is a land of magic. In the center of the magical land, located a beautiful crystal palace, called The Palace of Two Jagungs..
Eh..Whose cute car is that??? Only Getz, can complements the beauty of the Palace of Two Jagungs..
Only Getz, makes us feel complete..
Only Getz, will make us Get Get Getz whatever we dream of..
and CraZieST in a Getz. With Getz, we do whatever we want! Yay!!! All of us Getz to be happy too!! We Won The KFC Contest!!! I Spent A Night With MJ!